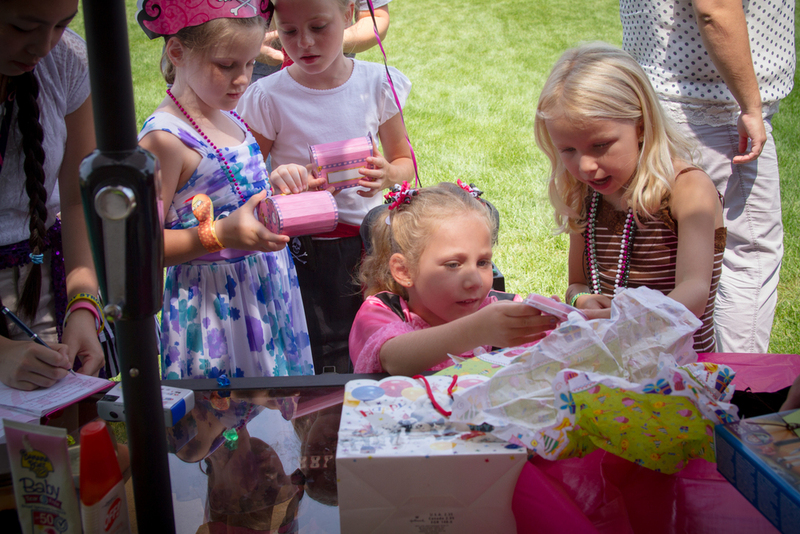 Happy 7th birthday to Brielle! 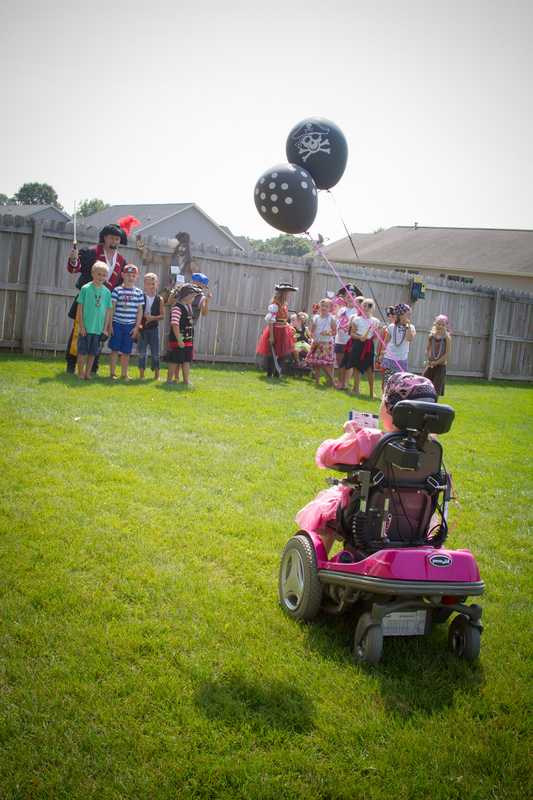 Brielle really wanted to have a princess pirate birthday party this year. She was so excited to help out with every detail. She even made her own party invitations! She made the drawing and then I scanned it in to my computer and added the text. 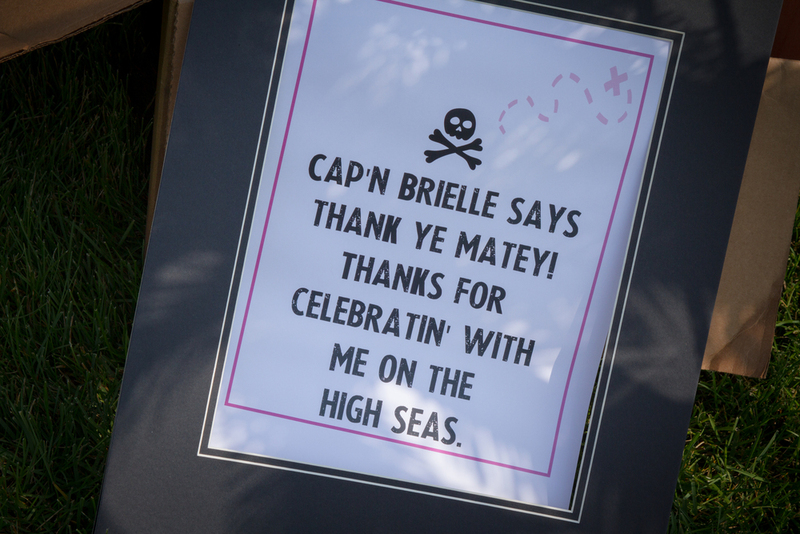 Next, we burned the edges and added a gold doubloon and then sent them out to friends. 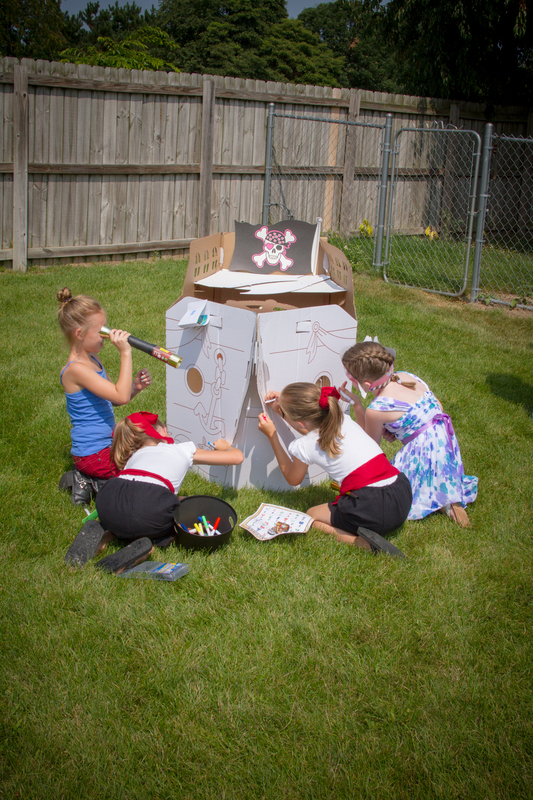 We had a treasure hunt and lots of different game stations set up all around the yard. 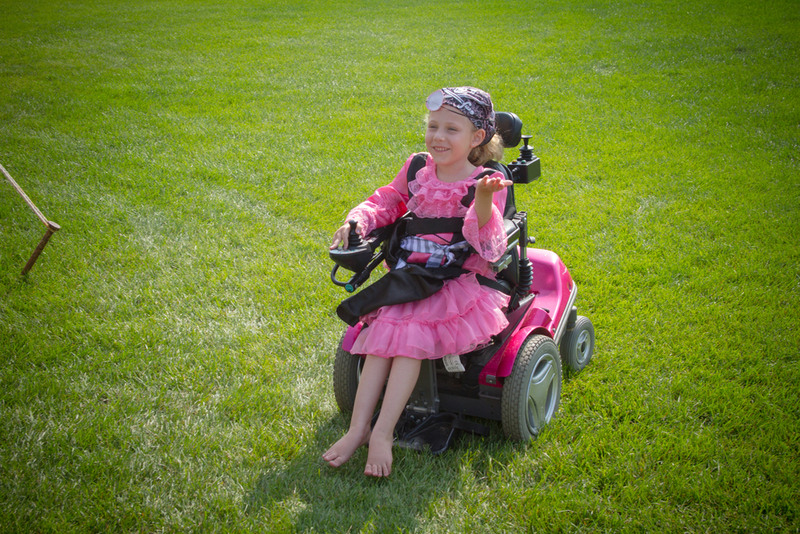 We were so thankful for a sunny day! 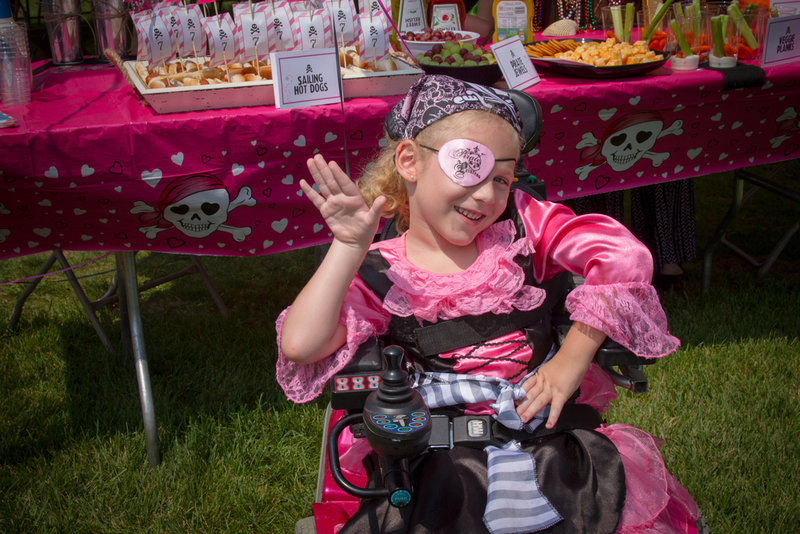 We had plenty of accessories for the kids to dress up even more like a pirate and then they sat down at the table for a "make your own treasure map" craft. 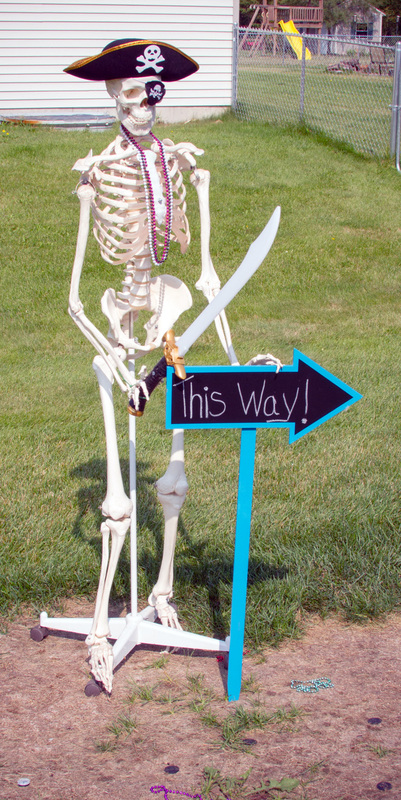 After everyone arrived, it was time to start the treasure hunt! 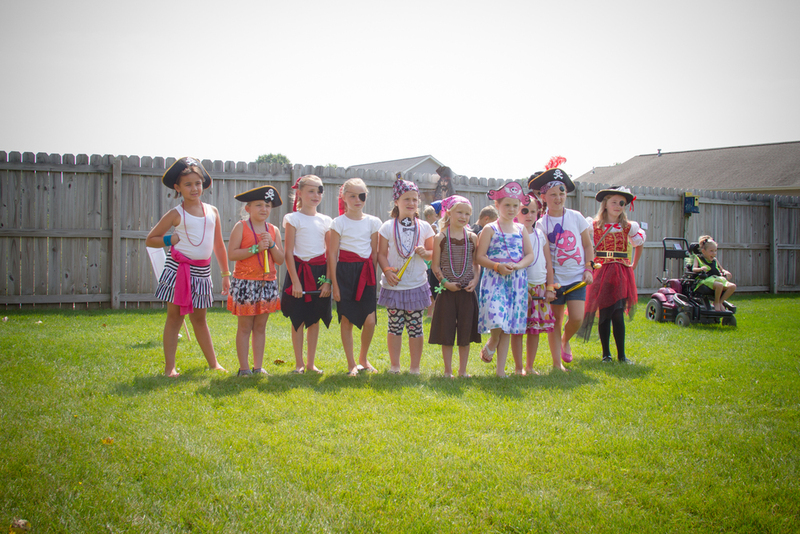 We split into four groups, the Buccaneers, the Sea Dogs, the Swashbucklers and the Scallywags. 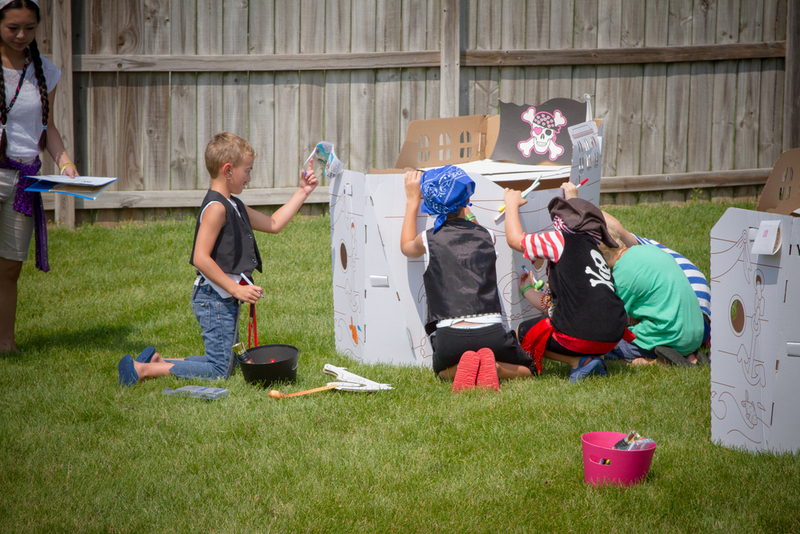 The kids played Captain Hook's Ring Toss, Pin the Treasure On The Map, Dig For Treasure (in the sandbox), Swab the Deck (sweep lots of pirate beach balls around a cone and back), Color & Sign The Cardboard Pirate Ships, and even got Pirate Tattoos! 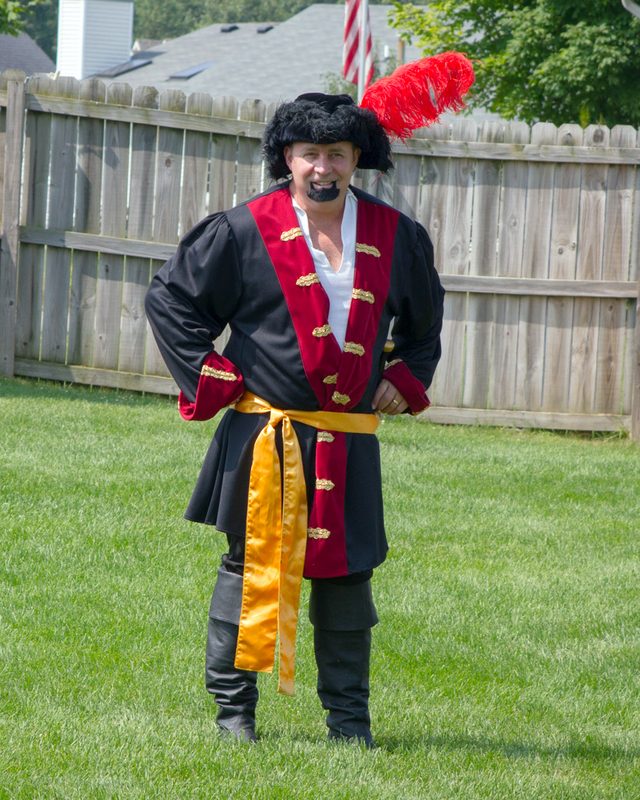 For lunch, we had Sailing Hot Dogs, Cannon Balls (orange cheese balls), Pirate Jewels (fruit bowl), Fish & Chips (goldfish and potato chips), Polly's Crackers & Gold Nuggets (crackers and cheese), Veggie Planks (carrots and celery). 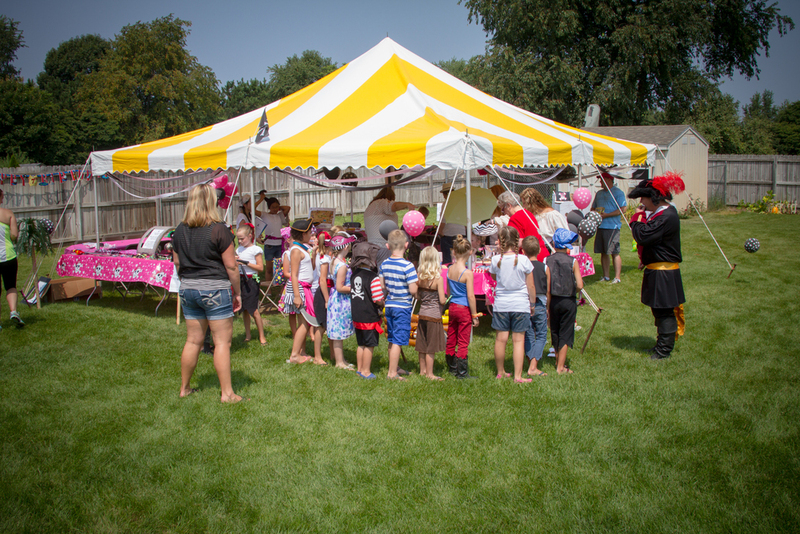 The food was a huge hit, especially the Sailing Hot Dogs! The pirate themed cake made by Rachel Boswell was amazing and tasted as good as it looked! 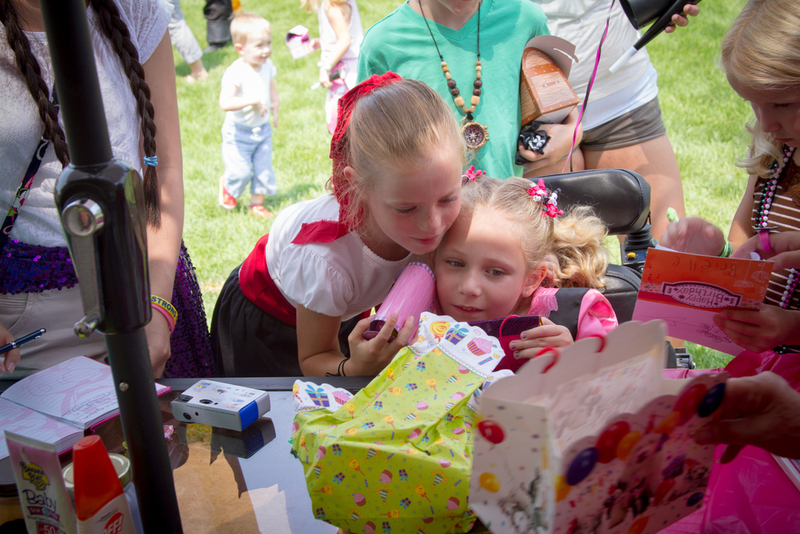 Brielle got every present she could have ever dreamed of having and absolutely loved being surrounded by friends and family throughout the day. 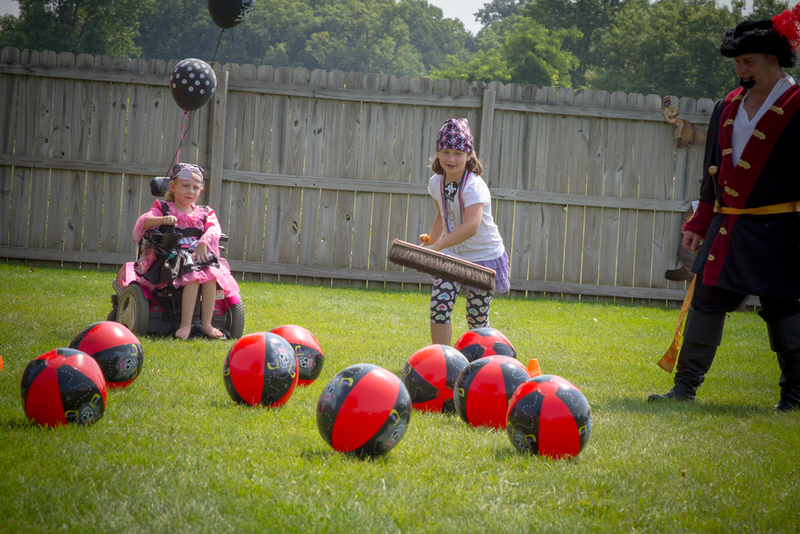 She was so happy and felt like every detail of the party was just perfect! 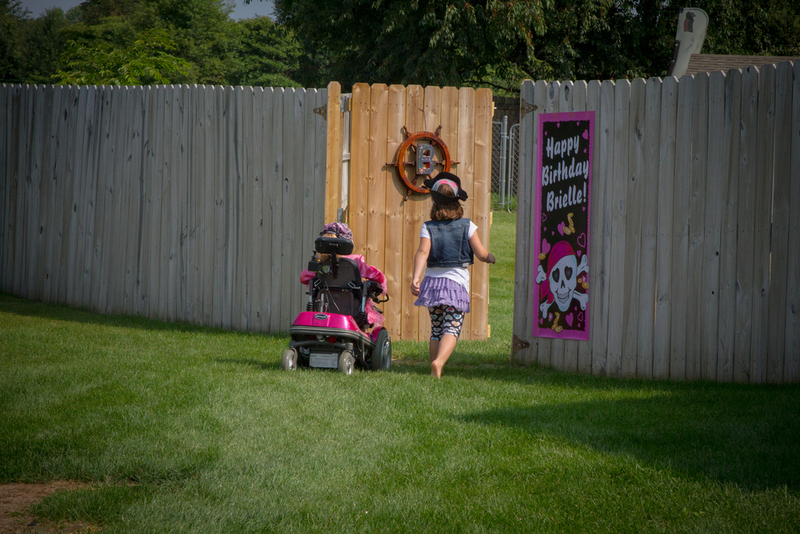 Thank you to our friends and family for helping us celebrate Brielle's special day, we will treasure the memories forever! 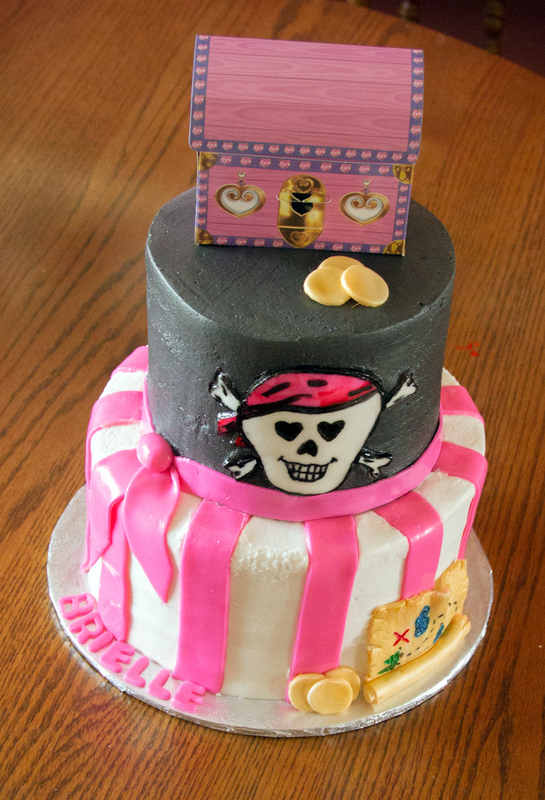 Rachel Boswell for the amazing Princess Pirate cake! A letter from the White House! Earlier this year on a day when Brielle stayed home sick from school, we watched her school morning announcements online. Her elementary Principal talked about how received a letter from President Obama because he was given the award of “Outstanding Practicing Principal” by the Michigan Elementary and Middle School Principals Association. In the packet he opened from the White House one of the things he showed was a picture of Bo Obama, the presidential dog! Brielle decided she would like to draw a picture of Bo and write a letter to President Obama and tell him how much she aspires to be a Veterinarian when she grows up. She hoped to get a letter back some day. Just a couple months later - Brielle got a packet in the mail from the White House too!! The packet contained a letter from the President on official White House letterhead, a signed picture of President Obama, an interview fact sheet with the President (did you know when he was young, one of his favorite books was Where the Wild Things Are by Maurice Sendak? ), a small picture of the dog Bo Obama and a really fun “Day in the life of Bo” pamphlet that details out Bo’s entire day. Bo is up at 6:30am and he heads off to bed around 7:00pm. His days sound very full of things to do! Brielle was overjoyed to receive this special packet in the mail. What a great way to learn about some American history. The picture of Bo Obama that Brielle drew and colored. The contents of the packet.